What do you look for when you are trying to find the perfect SUV? If the exterior style of the vehicle affects the way that you feel about that vehicle, overall, you will appreciate the popular mid-size SUV from Dodge that is the Journey. There are many classic color options available for those who choose to drive the Dodge Journey but there are also some fun color picks available if orange or red appeals to you. The special grille on this SUV helps it to stand out in a lineup of vehicles so that you will always feel that you are driving something unique. Finding the perfect SUV for you is important to our team in Riverhead, NY. 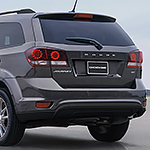 Allow us to show you everything that the Dodge Journey offers you. Come by Riverhead Chrysler Dodge Jeep Ram and our courteous staff will not only answer your questions, they will get you on the road for a test drive.